How would you describe a typical “Fulbrighter”? There is no one single profile of a typical Fulbrighter. In order for the Fulbright Program to be successful in its goal to promote mutual understanding, Fulbrighters must represent the richness and diversity of their home countries. Fulbrighters come from small villages and huge cities. They range from recent university graduates to established experts in their fields. They are students, researchers, and teachers at all types of public and private educational institutions including primary and secondary schools, community colleges, small liberal arts colleges, and large research universities. They are also visual and performing artists, journalists, scientists, engineers and other professionals. Fulbrighters come from a wide range of socioeconomic, ethnic, racial, and religious backgrounds. Many are seasoned travelers, yet for some, the Fulbright grant will be their first experience abroad. All Fulbrighters share a strong academic background, leadership potential, a passion for increasing mutual understanding among nations and cultures, and the adaptability and flexibility to pursue their proposed Fulbright project successfully. UNH hosted two Fulbright Program representatives on campus on April 7 for UNH Fulbright Day. 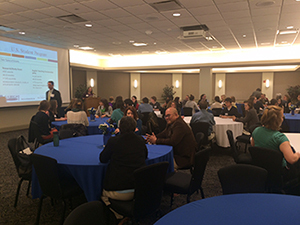 Over 100 students and 50 faculty members attended presentations and one-on-one meetings regarding the application process, the logistics of country selection and university affiliation, as well as the outcomes and benefits of a Fulbright award. Attendees were enthusiastic about this first-time UNH event. Pictured here are guests at a special lunch that offered prospective student applicants the chance to talk more casually with this year’s Fulbright finalists, previous Fulbright recipients, and faculty/staff who have served on the Fulbright National Screening Committee. Fulbright is the most widely recognized and prestigious international exchange program in the world, supported for more than half a century by the American people through an annual appropriation from the U.S. Congress and by the people of partner nations. The program—working with universities, schools, binational Fulbright commissions, government agencies, nongovernmental organizations and the private sector—actively seeks out individuals of achievement and potential who represent the full diversity of their respective societies and selects nominees through open, merit-based competitions. Fulbright grants are available for a variety of disciplines and fields, including the performing and visual arts, the natural sciences, mathematics, engineering and technology. Fulbright encourages applications from all fields, including interdisciplinary ones. Fulbrighters play a variety of roles, both during and after their Fulbright experiences. These roles include being students, scholars, teachers, lecturers, researchers, mentors, artists, philanthropists, cultural ambassadors, and social entrepreneurs. In addition to carrying out their proposed projects, Fulbrighters are expected to involve themselves in the host community, sharing their culture while at the same time observing the host culture. After their grant periods, Fulbrighters are encouraged to bring what they have learned through this cultural exchange home and teach others about the cultures they have experienced. Fulbrighters also are encouraged to continue the Fulbright experience by reaching out to their home communities, participating in Fulbright alumni activities, and networking with other Fulbrighters. Each Fulbrighter's experience is unique and depends on a variety of factors, including project details, location, and language abilities. Despite the variety of experiences, Fulbrighters all describe their experiences as life changing and having a profound influence on their professional and personal endeavors.